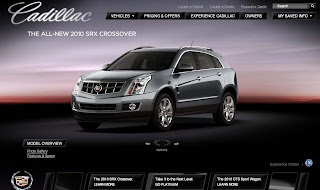 Cadillac released a complete redesign of their shopping site on October 23. The new Cadillac.com showcases the cars with larger images, 360 views on the home page and vehicle home pages, and includes a much more concise navigation. Large images with easy to read text also promote different areas of the site in a scrolling content area on the home page. There are some standout improvements on the site. Mainly the use of crisp studio images that make the cars easy to see while also maximizing the viewable space on the page. Cadillac also reworked some key short comings from their prior shopping experience, namely a much improved offers section that communicates any discounting or financing available. Some issues still remain especially in the brand experience and features sections of the vehicle pages. Cadillac’s Help Me Choose page provides an easy to use vehicle portfolio selection tool that allows users to select their vehicle needs by capabilities, price, features, and a few other options. It’s a helpful way to navigate the vehicle line for consumers who may not exactly know which Cadillac fits their driving needs. The biggest improvement is the redesigned pricing and offers area. Before (and I wish I had a screenshot of it) the Cadillac offers were very complicated to read and not easy to understand. The new site communicates offers in an easy to read format that clearly sections off each offer in a clear, precise way, whereas, the old site used to just list the offers in a string of line-by-line text. Now the offers communication is far clearer to consumers. Plus if there is still any confusion, there is a floating navigation item where one can ask a question and chat with a live person. One of the most glaring shortcomings is very limited information about a vehicle's features and options. The vehicle pages don't effectively communicate what the features or product strengths are. In fact, all the shopper gets to see is a Features & Specs page that lists everything as if people intuitively understand what an "Ultraview Sunroof" or "Xenon HID Headlamps" is. There is no detail information on any vehicle feature and this is a glaring shortcoming when comparing to other OEM shopping sites. Included in the new design is a brand section called Experience Cadillac where videos, concepts, merchandise, events and social media properties are promoted. Also included are links to learn more about OnStar and XM Radio. The issue here is that it looks like a brand messaging area similar to the Only Mercedes-Benz or Acura’s Advance experiences, but unfortunately there is no strong messaging in the Experience Cadillac section that communicates what the brand means; instead, it is simply a location for things that probably didn’t fit well into the main navigation neatly. The Experience Cadillac section also down plays the awards and accolades of the brand as well as the brand’s heritage by including that content in a lesser sub-navigation. What’s unclear is why these items are not highlighted in the tile navigation given to other elements of this section? One area that was baffling is the Lifestyle and Events content tile in Experience Cadillac. Clicking the tile shows a “Presidential Limo” tile that communicates the limo Cadillac developed for President Obama, but that’s it. Not sure this is a lifestyle communication, unless you’re the President. Certainly this content should evolve and may just be a content deficiency at launch to be later more fully developed. Some navigation and images are cutoff. When viewing the Vehicles navigation tab I can see some additional navigation elements but they are not viewable except for some top level text showing something is there (the missing elements are Compare Vehicles, Help Me Choose and CPO.) Also, when viewing the Experience Cadillac section and some other sections the “Cadillac” logo is missing the “Ca” of the image. This might be an issue with Macintosh as I was able to see these elements on a PC I also use. Overall the experience is much improved and the addition of the Help Me Choose and 360 views on the vehicle homepages are welcomed additions. The Experience Cadillac section holds some promise and hopefully will evolve into a better brand communication section instead of an area of the site for content that just needs a home.